Set in beautiful landscaped gardens with a stunning pool, these private apartments at Vilas Alvas are truly exclusive, being the only apartments in the area set amongst villas. Our raised ground floor apartment has a few steps leading to the pool, 15 metres from the front terraces and is the largest of the 22 apartments. Vilas Alvas is in the heart of the golden triangle and ideally situated equidistant between the prestigious Quinta Do Lago and Vale Do Lobo Luxury resorts. If you are familiar with the area, Vilas Alvas is just a 3 minute drive from the Praca, Julia's beach (Vale do Lobo) and Buganvillea Plaza (Quinta Shopping) . Alisuper supermarkets can be found at both Buganvillea Plaza and at the entrance to Vale do Lobo. Vilas Alvas is an Oasis of calm and tranquility. The location is ideal for lazy days relaxing by the pool when you want to and when you fancy grabbing a piece of the action, everything else is literally on the doorstep, from golf courses to gourmet restaurants. Me and my wife are originally from London and like most people living amid the hustle and bustle of busy cities, longed to spend days in more tranquil surroundings. We first holidayed in the Algarve some twenty years ago and it quickly became a favourite place above all other European destinations. Our apartment is the largest in the condominium;uniquely located to access the pool (which it overlooks) and gardens which again is accessed directly from any one of the 3 terraces. Sit and enjoy the beautiful gardens from any of the terraces whilst sitting on the very comfortable outdoor Rattan furniture, sunloungers or outdoor dining overlooking the pool and gardens (beautiful at night as well with the pool lights on). The location is beautiful,peaceful,exclusive and perfect for touring the Algarve and further afield. Golf on world class fairways,Horse-Riding, Aquatic sports from Jet-skiing to Beach massages are available along with the excellent selection of restaurants which are literally on the beach or stroll along the beach to the Praca at Vale do Lobo or even more restaurants located at Dunas Dourados a short walk on the board walk from the beach. This is a beautiful exclusive location with something for everyone of every age. En suite to master bedroom (leading firstly to the Dressing room) with bath/shower, twin basins, wc and bidet. Separate shower room with wc and face basin. All rooms air-conditioning: heats, cools, dehumidify's and bows air (like a fan). For owner use only. Unless long-term rental agreed. Large lounge/diner with round glass table and 6 chairs. Large double sofa bed and further seating. Cable TV, Hi-Fi, DVD player and working fireplace. Pull-out telescopic kitchen extractor hood to activate the vent & light. Fully integrated kitchen with cooker, hob, fridge/freezer, microwave, washing machine, dishwasher, Nespresso inissia coffee machine. On the lower ground (via staircase) floor why not borrow a book to read by the pool or on your terrace. There is an extensive library of books for all tastes. All the terraces over look the gardens and offer privacy. Bike Hire available £15 per day 3 days minimum hire. £50 returnable damage deposit per bike. Includes Helmet, bike locks and puncture repair kit. 3 terraces to choose from with rattan sofa seating (with privacy)outdoor dining for 6 or café style 2 seat table to master bedroom terrace. All overlooking the beautiful gardens and pool. There is Algarve Tennis and fitness club (www.algarevetennisandfitness.com) a few minutes drive. A tennis academy in Dunas Douradas/Vale do Lobo few minutes drive or 15min walk. All golfing facilities of Vale do Lobo and Quinta do Lago fairways and championship golf courses in the immediate vicinity (few mins). There is tennis, horse riding and nautical sports available. Further afield going east (approx. 40mins) there is the Monte Rei Golf and Country club (18 hole championship courses), Quinta da Ria and Quinta de Cima championship Golf courses (18 hole ). We highly recommend Monte Rei Golf Club, newly opened in June 2007, this Jack Nicklaus designed course is one of the most challenging on the Algarve, if not Portugal. It is approx. 40 minute drive from the apartment, close to the town of Tavira, but well worth the trip. 16m x 8m Pool with integrated baby pool. Lovely spacious apartment with access to a shared pool. Fantastic area. We spent 11 nights here in late September/early October, the first 8 nights shared with our daughter, son-in-law and granddaughter. We've been to Portugal a number of times but this was our first trip for 6 years and the first self catering trip for around 20 years! Portugal has definitely become busier and more expensive over the years but there is still a feeling of being relatively unspoiled. We were also fortunate in that our stay coincided with a late season heatwave and the weather was fantastic. October also meant that the complex was very quiet and there were only a few other people around on occasion. We contacted the owners on a couple of occasions and received almost instantaneous responses. That included allowing a later check out as we had a late flight - superb service. The apartment is spacious and well equipped with excellent beds and bedding. The apartment is the largest in the complex and has 3 (linked) outdoor terraces. There is a gate giving access to the pool area. Be aware this is primarily a residential complex so the beds and umbrellas around the pool typically belong to other apartment owners. However, the apartment has a number of sun beds that can be moved up and down to the pool area as needed. 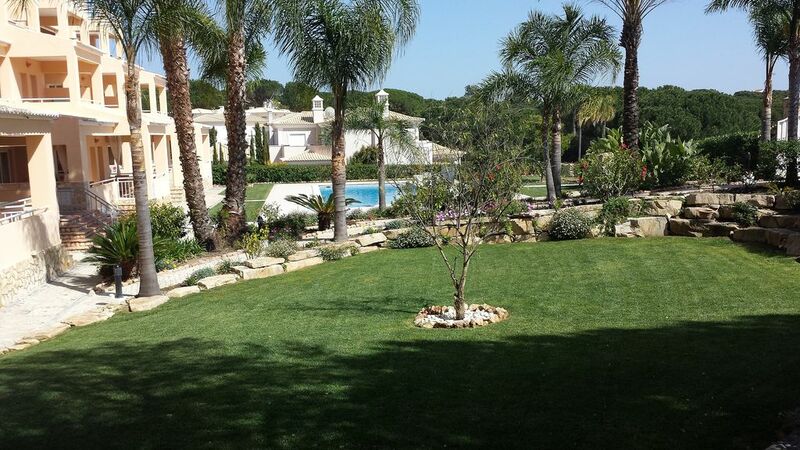 The area is lovely with ready access to a number of beaches and the complexes at both Vale Do Lobo and Quinta Da Lago. A car is a necessity and if you arrive late at night do a bit of pre-planning to find an open supermarket. We didn't and while we did manage to find take away food we couldn't get to a supermarket until the next morning. The owners kindly arrange to have a bottle of wine in the fridge which was great after a long days travelling. There are any number of restaurants within a reasonable distance. It is possible to walk to some close by (we used Xenia and Casa Pituxa on two occasions each) but being prepared to drive in the evening opens up any number of possibilities. For those hiring a car and coming to Portugal for the first time. Do some advance preparation to understand how the (somewhat arcane) toll charging system works and the various options. We have been to Portugal a number of times previously but hadn't driven for a number of years. Overall, a great holiday in a great apartment. We know the area well, having lived here for a year deciding whether to buy a holiday home. We decided to rent and give someone else the hassle of maintenance and come over about 3 times a year. Michael was very patient with my queries. The apartment is in a great location, although you would need a car. It has everything you need, dishwasher, washing machine, UK tv....Some friends joined us for our last 3 days and stayed on. If I was being picky I'd have liked another subbed, as there were only 3 and 4 of us. Luckily my husband isn't much of a sunbather. It is great to be able to access the pool area so easily. A few of the apartments were in use, so a nice atmosphere. Would definitely stay there again. A lovely apartment in a very quiet location but perfectly placed in a central position with lots of amenities on the doorstep, very well maintained with all necessary equipment. Would definitely revisit. We had a lovely stay. We know this apartment block well and always thought Michael and Donnas would be the best one to stay in. Yes we were right - it is well equipped and stylish. Brand new comfortable mattresses were a bonus. It's on the ground floor which we find useful as you have direct access to the pool . Great start to the day for me was on the veranda eating breakfast watching and listening to all the song birds. The pool area is very well maintained surrounded by beautiful shrubs. It is a quiet privately owned complex so if you're looking to blast music and party into the small hours forget it. I dealt with Michael and he was very professional - with clear instructions for keys etc. I would recommend this accommodation and intend to rent again . The famous Julias beach is 5 mins away by car and The Praca is about 10. We enjoy the local town of Almancil for a coffee mid morning with the locals ( very cheap). There are too many restaurants to mention - Casa Dos Pineros is great( a bit pricey) and Murofos near Quateria is the only place for chicken (great value). Almancil has quite a few new restaurants - Casvostra is a favourite haunt. You will enjoy this apartment - it does exactly what it says on the tin!! Apartment was a 20 minute drive from the Airport in a very exclusive development, on arrival the owners had kindly left us a complimentary both of wine ( Which was a nice touch ). On arrival the apartment was very clean with ample room for the 5 of us 4 adults and one child, loads of bed linen towels etc and the added bonus of a fold up bed. we virtually had the pool area to ourselves for the 8 days which was very nice, access to the pool is directly from the raised balcony at the rear of the property. there are many local sandy beaches as well as local restaurants which are reasonable in price considering the great location. Overall we had a great stay and would certainly stay at this apartment again if visiting Portugal again which is highly likely as its a fabulous country to visit for an holiday. 15 minutes walk (3 minutes by car) will take you to a 10km stretch of golden sandy beach and restaurants overlooking the sea. An easy 15-20 minutes drive will take you to the Algarve's vibrant capital Faro. Don't just think of the Algarve for your summer break. The temperate and sheltered climate means the weather is great in April, October and at Christmas time too. So why not take a well earned break out of peak season - you'll be pleasantly surprised. Faro airport is 15 mins drive. Car hire is recommended. Michelin starred restaurants and shopping facilities of Bougainvillea plaza and Vale do Lobo are minutes by car as is Quinta Do Lago and the main town of Almancil. Faro is a 15 min drive. The general area is well served by restaurants, shops, supermarkets and banking facilities. The Ria Formosa nature reserve is close by. Many other places of interest eg. water parks, can easily be reached by car in 20 minutes. River trips, Jeep Safaris, Sea day trips with barbecue on a secluded beach. Excursions to local markets and other places of interest in the Algarve, to Seville and Lisbon. All infomation and tickets can be gained from the local Algarve Tourist Office ( 1km away from the apartment). Booking Notes: 30% non-refundable deposit within 3 days of confirming booking. Balance plus refundable breakage/damage deposit of £250 due 8 weeks prior to arrival. A complimentary bottle of wine is provided to get your holiday off to a good start.. Full air-conditioning, Fogo Montanha log fire. A charge of £125 per week will be made for Jay-b in the apartment, if required. Bike Hire available £15 per day 3 days minimum hire. £50 returnable damage deposit per bike. Includes Helmet and bike locks. Changeover Day: Flexible.